ROMEO by Romeo y Julieta. The cigars featured an all-new, clean and modern look for the brand, backed by a more lively and energetic profile—made to please the modern enthusiast. The cigars went on to win Cigar Aficionado's No. 3 Cigar of the Year award for 2012 and the brand exploded! Since this time, there have been a number of sequels to the ROMEO collection, with the most recent coming from a unique collaboration between RyJ, A.J. Fernandez, and Rafael Nodal (of Aging Room Cigars fame). 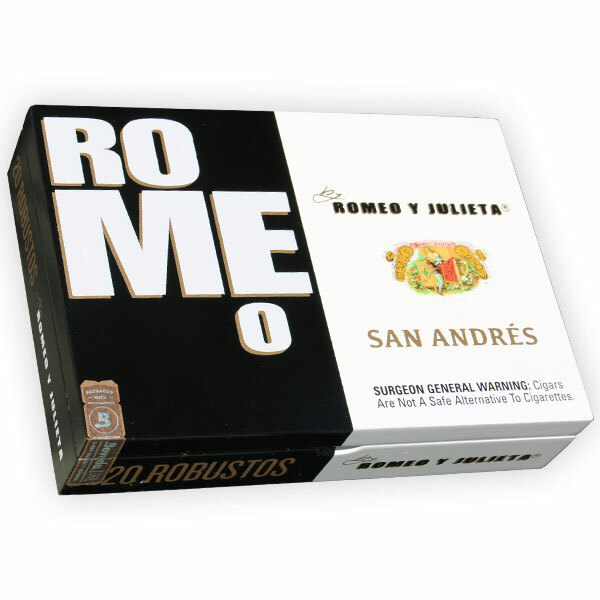 The cigar is dubbed ROMEO San Andrés by Romeo y Julieta, introducing the first RyJ to feature a Mexican wrapper. ROMEO San Andrés, like many other vintage brands brought to life, is rolled at A.J. Fernandez's highly sought-after factory in Estelí. The blend incorporates a Nicaraguan and Dominican filler recipe, bound in a Nicaraguan leaf and wrapped in the cigar's signature Mexican San Andrés wrapper leaf. The blend uses aged tobaccos and was developed to showcase deep complexities and supreme balance. Enthusiasts can expect a medium-plus body and rich flavors of earth, cocoa, mocha, sweet raisons, and nice kick of freshly ground black pepper.